Having watched Mexico fade away into the distance in a completely imaginary rear-view mirror, Tony and I charged into Belize officially kicking off Stage five of the Tour De Zack y Tony AKA Operation: Jungle Boogie! That is right, we are now on the pen-penultimate stage of this epic journey, a stage which carries us for the first time into that fabled jungly civil war-torn land of Central America. In terms of keeping up team morale, this stage of our adventure will be the final big hump on the road to Colombia. Once completed, only a mere 1,500 km or so will separate Tony and I from the promised land of beautiful women and cold beer. 1,500 km? What’s that? I can spit that far. Things could get wet and wild. After our first morning in Belize, Tony and I have since sat down and pored over maps, notes, and guidebooks to fill our blank minds with routes and destinations. 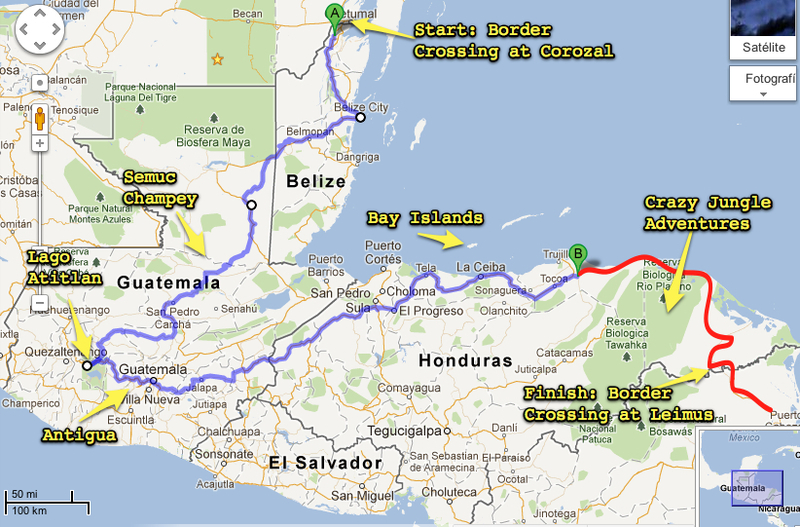 We’ve now tentatively come up with a 2,000 km route for Stage 5 that cuts through Belize, meanders it’s way through the steep bits of Guatemala, and then wraps around the wildest corner of Honduras to a remote border crossing in the north of Nicaragua. It skips El Salvador entirely. We have two principal concerns about this route. First, that wild corner of Honduras – what Lonely Planet calls the “last untamed wilderness in Central America” – could easy become a nightmare now that the rainy season is upon us. Rainy season can turn dirt tracks into rivers, rivers into raging torrents, and hills into landslides, making an already difficult route completely impassable. Also, increased rains mean the mosquito population goes up (along with the risk of catching Malaria). The second concern is that we are picking the longer and more difficult route at a time when our travel spirit is beginning to wane and we are beginning to feel progressively more tired. Might it not be a better idea to take the shorter more direct route through El Salvador shaving off more than 700 km from the tour? It might be, for both the reasons above. So we also have a Plan B. 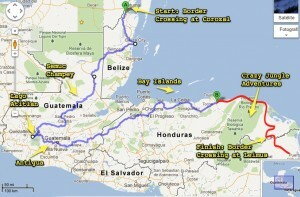 Plan B is to loosely follow the pacific coast through El Salvador and a short 100 km segment of Honduras into Nicaragua. Indeed, this would save us at least 700 km of difficult riding conditions. Belize: The odd on out in Central America. It’s a tiny, peaceful english-speaking country with a Caribbean Flair. Semuc Champey: A naturally formed 300m limestone bridge with cascading pools of water on top. Rumor has it that is one of the prettiest spots in Guatemala. Lago Atitlan: A lake surrounded by volcanoes up in the indigenous-rich highlands of Guatemala. Antigua: Former capital and Colonial city, Antigua is all the rage on the traveler circuit. According to Lonely Planet it is Guatemala’s “one must-visit destination”. Did somebody say salsa nights? Diving in the Bay Islands of Honduras: Cheapest dive spot in Central. Might as well get a few in eh? The Moskitia: Visiting isolated communities in dugout canoes in the middle of crocodile-jaguar-macaw-toucan infested jungles? Where do I sign? 10,000 km Party! It’s Happening! That’s right! Tony and I would like to cordially invite you to our 10,000 kilometer celebration! Indeed, this is the stage where we will be celebrating possibly the largest odometer-related celebration of our lives! So bring your bottle of champagne and join us on the road as all those nines tick over to zeroes. Location and time of the party are TBA, but we expect it to take place in eastern Guatemala somewhere on our way to Honduras, mostly likely in the middle of nowhere. You can’t actually spit that far. Also I would like to see a crocodile-jaguar-macaw-toucan in the wild.